Palestinian Vision and Burj Al-Luqluq Social Center Society organized a tour to Halhul on Thursday, 17 September 2015 for a number of Jerusalemite youths within Youth Groups project, funded by the Higher Council of Youth and Sport and supported by the UNFPA. 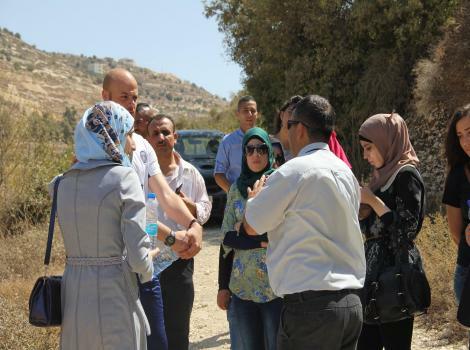 The participants visited Al-Haskeh Valley, Quf Valley and Beith Kahel. This tour is considered one of the activities of Jerusalemite Groups project which is executed in order to enhance the communication between the Jerusalemite youth, in addition to enhancing the one-team spirit thorough working with youths on executing a number of community initiatives that serves the city of Jerusalem.